bold art show in support of bernie sanders opens in l.a.
Shepard Fairey showed his work, Money Mark made some music, and many other artists celebrated creations inspired by, and in support of, the presidential candidate. On Saturday night in West Hollywood, HVW8 Gallery's national group art exhibition, "The Art of the Political Revolution — Artists for Bernie Sanders," kicked off with an opening bash. The show, which carries a strong message of social justice, features work from over 100 artists, and was created in conjunction with the official Bernie Sanders 2016 campaign. Street- and pop-inspired artists like Cody Hudson, Kozyndan, and Shepard Fairey (whose iconic Obama "Hope" poster helped to galvanize the youth vote in 2008) contributed pieces to the exhibition, which will soon travel around the U.S.
Los Angeles-based artist Nathan Bell is one of the creators of work for the show. He tells i-D why he was inspired to make a piece in support of Sanders: "America is standing out for all the wrong reasons today, like violence, racial and gender injustices, political and corporate corruption, debt-inducing education, and unprogressive health-care systems. Our leaders cannot be trusted, choosing to make decisions fueled by ignorance, money, or hatred. We need leaders like Bernie Sanders who have a history of compassion." Bell says, explaining the piece he made for the show (see below), "A slight word change and color swap are meant to convey the antithesis of Trump's well-known campaign slogan." Bell's work is informed by pop culture, music, as well as graffiti and other street art. 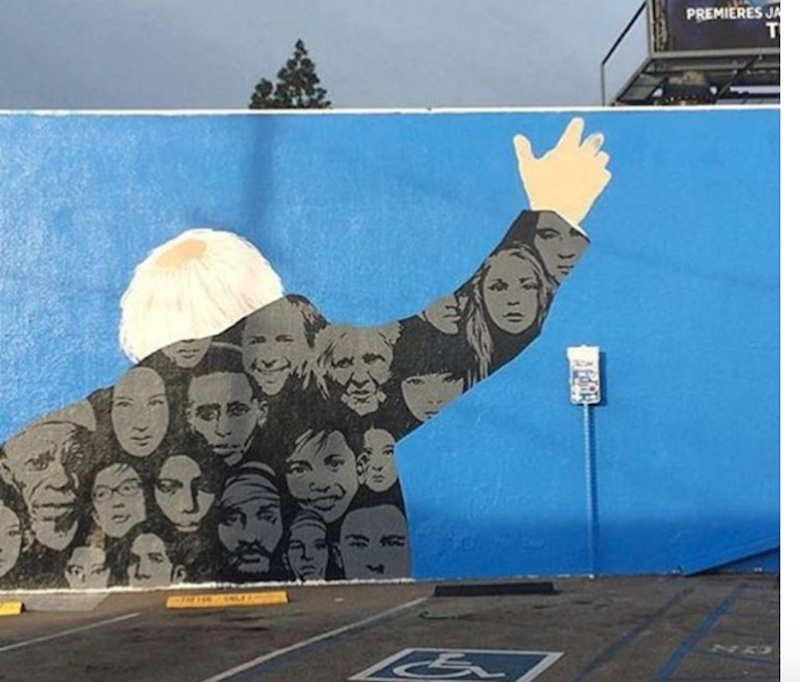 Of his piece entitled "Make America Relate Again," Bell says, "Its loose, hand-done type and acrylic spray are used in a lot of my work, and I liked that it feels authentic to the underground movement that is the backbone of Bernie's 2016 campaign." "The Art of the Political Revolution" runs through January 31, 2015 at HVW8 in Los Angeles. Future exhibitions and locations include: Austin, Boston, and New York; more to be announced.